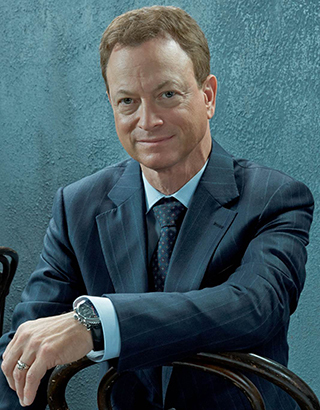 Actor and humanitarian Gary Sinise has been actively and tirelessly supporting the troops for over thirty years. Among his numerous film and television roles, it was his portrayal of Lt. Dan Taylor in the landmark film Forrest Gump that formed a lasting connection with servicemen and servicewomen throughout the military community. After several USO handshake tours in 2003, Sinise formed The Lieutenant Dan Band and began entertaining troops serving at home and abroad. Performing everything from pop hits to classic rock staples, the 12-member cover band has played for over a 500,000 troops and their families. His endless work on behalf of those who have served has earned him many distinguished awards, including the Bob Hope Award for Excellence in Entertainment from the Medal of Honor Society, the Spirit of the USO Award, the Ellis Island Medal of Honor, and, in 2008, the Presidential Citizens Medal. Sinise is only the third actor ever to receive the second-highest civilian honor awarded to citizens for exemplary deeds performed in service of the nation. He was recently presented with the Spirit of Hope Award by the Department of Defense, and was named an honorary Chief Petty Officer by the Navy. In 2011, Sinise launched the Gary Sinise Foundation to honor our nation’s defenders, veterans, first responders, their families and those in need by creating and supporting unique programs designed to entertain, educate, inspire, strengthen and build communities. The flagship initiative, R.I.S.E. (Restoring Independence and Supporting Empowerment), is a custom Smart Home building project for severely wounded veterans. Each home is customized to ease daily challenges and help restore independence, with features like retractable cook tops, cabinets and shelving, elevators, and more, all accessible via an iPad. Other programs include Relief & Resiliency Outreach, Invincible Spirit Festivals, Serving Heroes, and Arts & Entertainment Outreach. Over the years, the Gary Sinise Foundation has formed numerous corporate partnerships with companies such as American Airlines, Jos. A. Bank Clothiers, Sysco Foodservice and, most recently, with GE on their Get Skills to Work program that helps veterans translate military skills into advanced manufacturing jobs while empowering employers with tools to recruit, onboard and mentor veterans. The Gary Sinise Foundation is a 501(c)(3) organization. For more information, please visit www.garysinisefoundation.org.